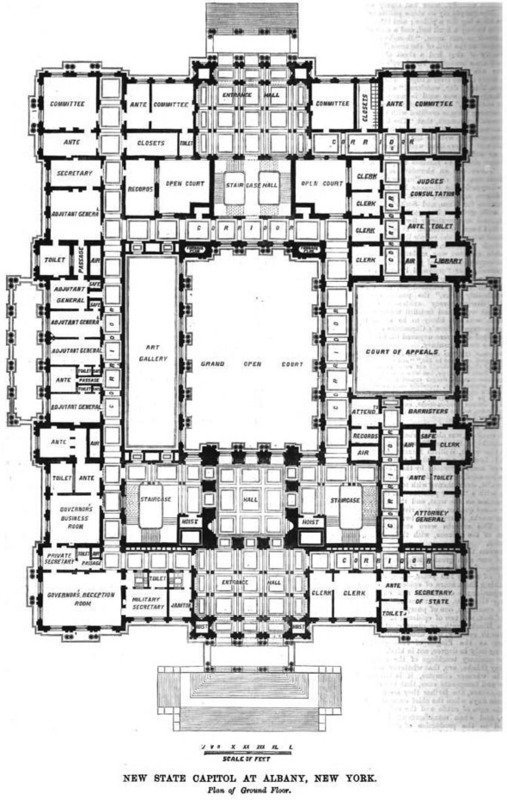 From The Builder, May 28, 1870: STATE houses or capitals are rising in various parts of the United States and we have already given views of more than one. The site of the building at Albany illustrated in our present number is very commanding being about 170 ft above the level of the Hudson and has an area of ten acres. It is bounded on the south by State street and on the north by Washington avenue 100 ft in width. The land falling off rapidly to the north south and east this buil ing with its high walls still higher pavilions turrets and towers will be seen to advantage. In the exterior composition of the design there is a general adherence to the style of the pavilions of the New Louvre of the Hôtel de Ville of Paris and the Maison de Commerce recently erected in the city of Lyons. The terrace which forms the grand approach to the east or principal front will form a striking feature. 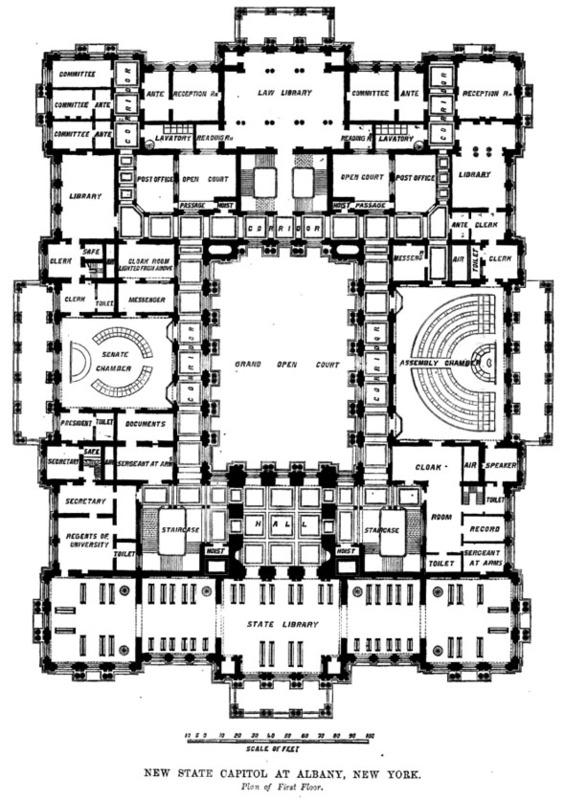 The exterior is 290 ft long north and south and 390 ft east and west The floor immediately above the level of the plateau of the leading to the loggia or hall of entrance occupying an area of 60 ft by 74 ft and 25 ft in terrace will be entered through the porticos on Washington avenue and State street and through the carriage entrance under the portico of the east front with the first or main entrance floor will be reached by a flight of steps leading to a loggia or hall of entrance of 60 ft by 74 ft and 25 ft height.